Massachusetts has strict gun and weapons possession laws. If you are convicted of carrying a firearm without an F.I.D card, you face a mandatory minimum eighteen-month house-of-correction sentence. A Mandatory minimum sentence means that the judge has no discretion to impose a lighter sentence or to provide probation. The minimum mandatory penalties are heightened if you have prior convictions for similar offenses. Possession of Ammunition falls under the same chapter and section (c. 269 s. 10(h)) as possession of a firearm in your home. The definition of ammunition encompasses cartridges or cartridge cases, primers (igniter), bullets or propellant powder designed for use in any firearm, rifle or shotgun. The term ammunition shall also mean tear gas cartridges, chemical mace or any device or instrument, which contains or emits a liquid, gas, powder or any other substance designed to incapacitate. While ammunition must be designed for use in a firearm, there is no requirement of current functionality, thus the prosecution need not show that the ammunition has the capability of being fired. A Large Capacity Feeding Device or weapon encompasses both a large capacity ammunition belt and magazine. A large capacity ammunition belt is one which holds more than ten rounds of ammunition to be fed continuously into a semi-automatic rifle or shotgun. A large capacity magazine is a box, drum, or other container which holds more than ten rounds of ammunition to be fed continuously into a semi-automatic rifle or shotgun. Conviction under chapter 269, section 10(m) of possession of a large capacity feeding device carries with it a state prison sentence of two and a half to ten (2 1/2 – 10) years, with a minimum imprisonment of one year. Conviction under chapter 269 s. 10(c) requires the prosecution to show possession of a machine gun or sawed off shotgun. According to the Massachusetts General Laws, a machine gun is defined as　a weapon of any description, by whatever name known, loaded or unloaded, from which a number of shots or bullets may be rapidly or automatically discharged by one continuous activation of the trigger, including a submachine gun. A sawed off shotgun is　any weapon made from a shotgun, if as modified, has one or more barrels less than 18 inches in length or an overall length of less than 26 inches. Conviction under this statute is extremely serious carrying with it a minimum mandatory sentence of 18 months, and a maximum exposure of a life sentence. 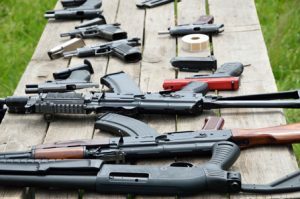 If you have been charged with possessing a firearm outside your home or possessing a machine gun or sawed off shotgun, you may also be facing charged under this subsection of the statute. Pursuant to chapter 269, section 10(n), an individual convicted of possessing a firearm, as referenced in the prior sentence, can also be convicted of carrying that weapon as loaded. If convicted, the offender faces up to 2 1/2 years in jail set to begin after the sentence imposed on the underlying case. The law states that whoever, while in the commission of or the attempted commission of an offense which may be punished by imprisonment in the state prison, has in his possession or under his control a firearm, rifle or shotgun shall, in addition to the penalty for such offense, faces a mandatory five year state prison sentence. If that firearm is found to be a large capacity weapon or　machine gun, faces a mandatory ten year state prison sentence. An individual will face enhanced charges as an “Armed Career Criminal” under chapter 269, section 10G of the Massachusetts General Laws if having been previously convicted of a violent crime or of a serious drug offense is convicted of possessing a firearm. This conviction based upon the number of qualifying prior offenses faces between a mandatory sentences ranging from three (3) to fifteen (15) years in jail.